In small bowl, mix flour, chili powder, 1 tablespoon salt and 1 teaspoon pepper. Line up 3 like-sized baking dishes or shallow bowls. Place flour mixture in first dish. Place beaten eggs in second dish. In third dish, place bread crumbs. To bread fish fillets, coat with flour mixture, dip into eggs, then coat with bread crumbs. Set aside on platter or baking tray. In 12-inch nonstick skillet, heat 1/3 cup of the oil over high heat. Add half of the fillets; cook about 2 minutes or until lightly browned and crisp. Turn fish; cook other sides 1 minute. Remove from skillet to warmed serving platter; cover to keep hot. Cook remaining fillets, adding more oil if necessary. Add garlic and chile to hot oil in skillet. Season with salt and pepper. Cook and stir 2 minutes. Add basil; cook and stir 2 minutes to crisp. Toss in orange peel. 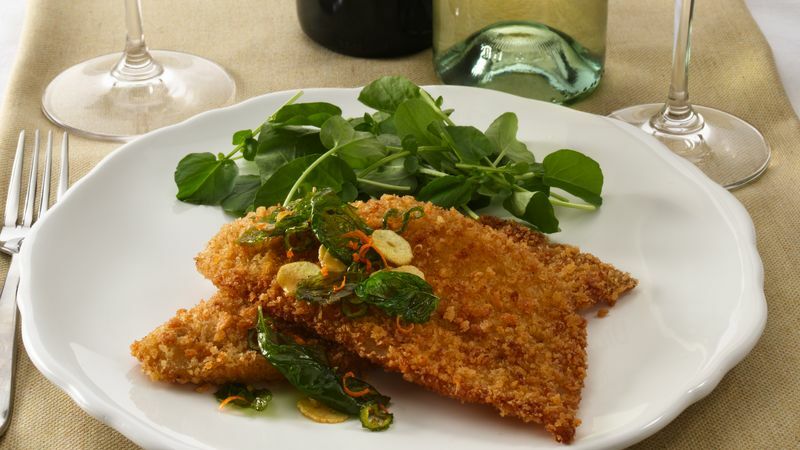 Arrange fillets on serving platter or individual plates; top with the basil, garlic and orange mixture. "Keep discovering. Explore new tastes, new combinations and new ideas, and then share them. Whether it’s a new special ingredient or a new cooking technique, when you introduce your guests to something exciting, an ordinary meal turns into a journey of discovery."